February 8th Bangalore 2018: Apollo Spectra Hospitals, the leading surgery specialists in the country along with Regenerative Medical Services Pvt. Ltd., (Regrow) the first Indian Biotechnology Company together marks another milestone in the country’s medical history by performing a revolutionary bone cell therapy OSSGROW on a 44-year-old accident survivor from Bangalore. A team of doctors led by Dr Gautam Kodikal from Apollo Spectra Hospitals successfully performed the new generation regenerative medical treatment on Mr Rajkumar, who was intensely suffering from the condition called avascular necrosis, which had progressed post meeting with an accident. 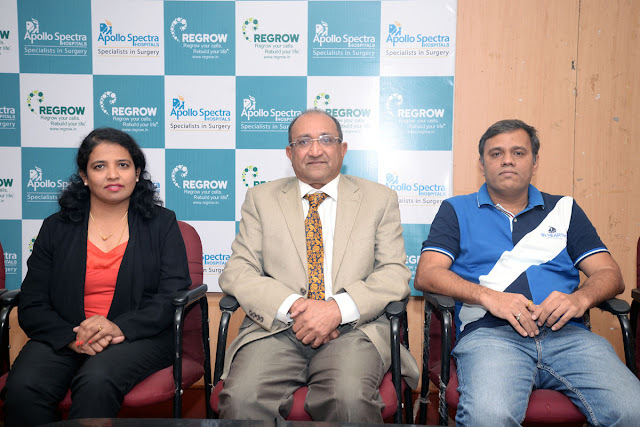 The surgery was done at Apollo Spectra Hospitals and Regrow’ s center at Koramangala, Bangalore. OSSGROW is a patient specific natural and biological regenerative medical treatment that allows the formation of new bone in the area of bone loss naturally providing restored mobility without any side effects. It is considered to be the first ever painless bone therapy in the world which helps in early intervention to treat disorders like osteoarthritis and resumes patients to their normal lives at the earliest. Conditions like avascular necrosis of hip joint, non-healing fractures and bone defects of oral cavity and maxillofacial region could be successfully healed through the therapy. Avascular necrosis is a condition affecting more than 1.4L people annually due to loss of blood to the bone caused by hormonal imbalances, decrease in physical activity, aging, excessive medications, excessive alcohol, and smoking or traumatic accidents/injuries. Bone is a living tissue that requires blood, an interruption to the blood supply causes the bone to die. If not treated, this process eventually causes the bone to collapse and the only solution to it is total hip replacement. Mr. Rajkumar was suffering from an acute and intense pain in his left hip region resulting from a hip surgery post meeting with a chronic accident. He had 3 internal screws fixed immediately to ease the damage done. However, this couldn’t fetch him a permanent solution since minor pain and a pinching sensation persisted for more than 10 years. The doctors eventually had to remove the internal implant, which was initially a support for his hip, and over time even his mobility was impaired. In 2017, he was diagnosed of post-traumatic avascular necrosis in his left hip, which had progressed to a chronic stage affecting his overall mobility. 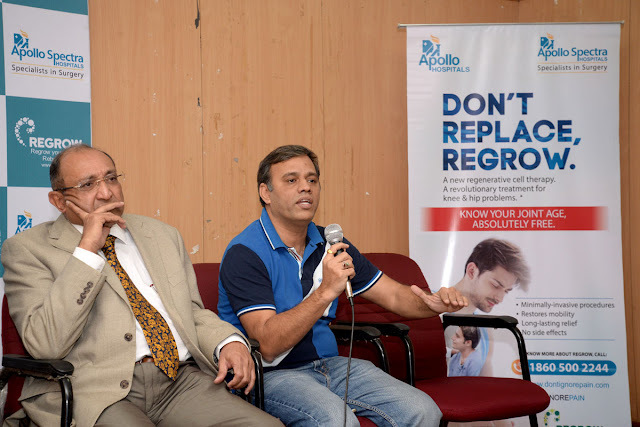 Dr Gautam Kodikal at Apollo Spectra Hospitals, advised Rajkumar a natural and biological solution, Bone Cell Therapy OSSGROW ®, where a small amount of body fluid is taken from his own body and sent to RMS Regrow GMP laboratory for bone cell culture. After 4 weeks, his own cells are then implanted on the damaged area, which will result in bone regeneration and the return of normal hip joint function. Apollo Spectra is a multi-specialty hospital which offers quality healthcare with all the benefits of a large hospital but in a friendlier and more accessible facility. With 10 centers across 7 cities – Bengaluru, Chennai, Delhi, Jaipur, Kanpur, Mumbai and Pune, over 50,000 successful surgeries with excellent clinical outcomes, and over 700 leading doctors, Apollo Spectra Hospitals continue to set new standards of healthcare services. Apollo Spectra strives hard to establish centers of excellence in Orthopedics, Obesity, Urology, MIS and ENT. It also offers specialized and comprehensive treatment for Gynecology, Vascular Surgery, Pediatric Surgery, Gastroenterology (Surgical and Medical),Endocrinology, Plastic & Cosmetic Surgery, Cardiology, Dermatology, Dental, Ophthalmology, Maxillofacial Surgery and Emergency. Advanced technologies, world-class infrastructure, minimally invasive procedures and the best of doctors all come together to deliver personalized care enabling faster recovery with near-zero infection risk. Clinical excellence being Apollo Spectra’s founding value, Apollo Spectra allows easy admission and discharge facility to ensure a hassle-free experience for its patient. Regenerative Medical Services Pvt. Ltd. is the first Indian Biotechnology Company established in the year 2009 to introduce cutting edge technology platform for regenerative medicine in India. Vision of Regenerative Medical Services Pvt. Ltd. is to contribute in improving human healthcare by delivering safe and effective patient specific regenerative medical treatment. The aim of regenerative medicine is to replace, repair or enhance the function of damaged tissue or organs by accelerating and securing natural process with autologous cell therapy via minimally invasive techniques without side effects.